Every story needs to be set somewhere. Many of the best stories have vivid settings that are far more than a backdrop but are integral to the story. But how do you, the writer, choose whether to use an existing setting or make one up yourself? What all is involved in the decision between real and fictional settings? Let’s look at the pros and cons. A true-to-life setting may be the best bet for historical stories and some present-day tales. You don’t have to invent anything! Just find a map. You can use real businesses, parks, residential areas, etc. Readers familiar with the area appreciate the authentic touch. It can give you ready-made places to hold a book signing. Locals might object if a business owner is sleazy or a murder happens in the Presbyterian Church on the corner of 10th and Victoria. There might not be a real town with the attitudes, micro-climate, or service groups you need. If you’re writing speculative fiction, in particular, you don’t have much choice but to create a totally made-up setting. You can make sure the library is next door to the park or the river, depending on what’s needed for your plot to work. It takes a lot more time to create a city or regional area than to peruse maps of a suitable place. It’s harder to create a sense of place. Sometimes a hybrid setting makes the most sense, especially for contemporary novels. The story can absorb all the benefits of local flavor with its topography, climate, and demographics. You can add suburbs or side streets for your characters to live on in well-known residential areas. You can add a coffee shop or theater where you need one. In general, the most authentic-feeling settings to your readers will be real ones—or ones you spend a lot of time creating in depth. What’s your preference as a reader? As a writer? 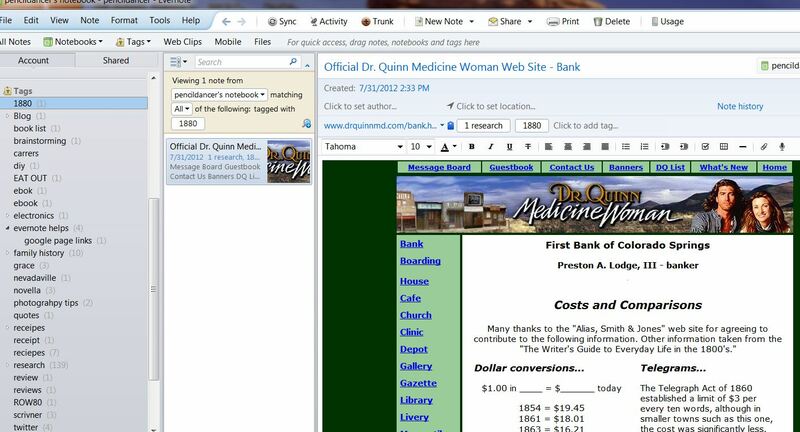 Evernote has become one of my top valuable tools for taming my writing research. When you download evernote you are asked to set up a notebook. Think of it as a bookshelf where everything is filed. 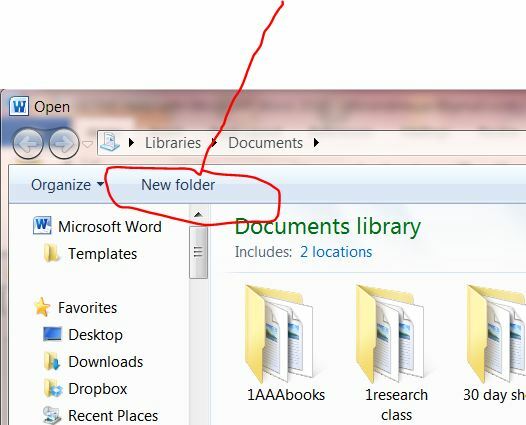 To make specific notebooks click on the notebooks icon, select new notebook and name it. I have notebooks for my current works in progress where I keep the synopsis, character information and current chapter I’m working on. Doing that allows me to ‘write and think’ on the go. I can pull up the information while waiting somewhere or maybe when I need a break from my office. I may have too many! I use a research tag as a main tag, under that I add other tags, this allows me to collapse the research tag when I’m not using it. Less visual clutter is always a good thing, right? Below you’ll see that tag expanded and my travel tag is open. While writing A Bride’s Dilemma in Friendship, Tennessee I realized the research collected could be used for other books. 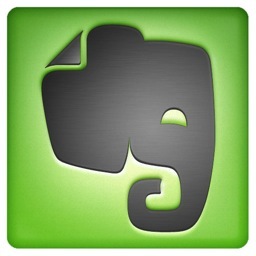 Evernote is a perfect place to store my online library. I even store photos that catch my eye for possible characters and settings, without fear of that nasty copyright law since it’s for personal use. A blog notebook is useful for collecting those enticing tidbits for later blog posts. A dialogue notebook could hold audio snippets of conversations from museum tours or how an accent sounds. 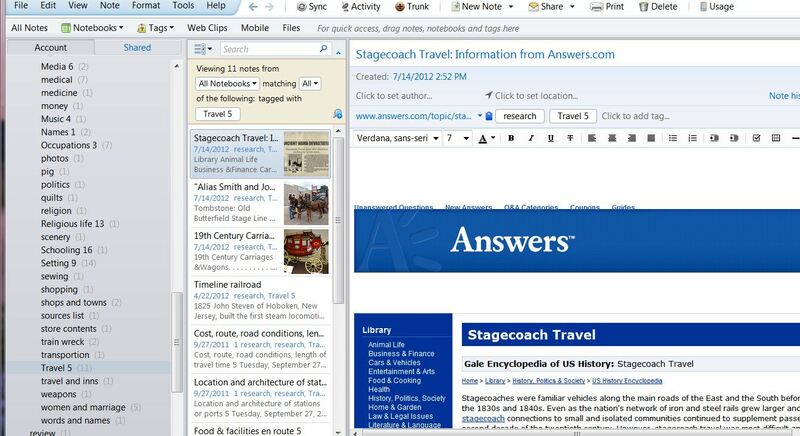 I use Evernote for real life too, collecting gluten free recipes, restaurants I’d like to try and family history. Evernote is free if you stay under a certain amount of data. I did pay for a subscription because I was collecting a lot of family information and went over my limit. Have I given you enough information to want to try Evernote? Once you download it don’t forget to search for articles and videos to help you. 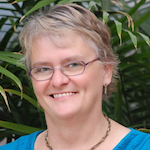 Diana Brandmeyer writes historical and contemporary romances for the Christian market. Once widowed and now remarried, she writes with humor and experience on the difficulty of joining two families be it fictional or real life. In my last post, I talked about Freeing Your Muse—why your muse is important to your writing. What I didn’t get into was how. There are a variety of methods, but one that works for me is mind mapping, otherwise known as clustering or free association. Here’s what you do. Take a large white board (mine is 36″ x 48″) or a large piece of paper. By large, I mean the back of those blotter style desk calendars. Barring the availability of those, tape 4 or more pieces of printer paper together in a large squarish rectangle. Gather as many colored dry-erase pens (or a multi-pack of sparkly gel pens if you’re using paper) as you can find. Your muse likes color. Write something in the center of your space and circle it. The “something” depends on what problem you’re trying to solve. Sometimes I put my character’s name in the middle. Sometimes I put a sticky plot problem there. Sometimes it is the name of a fictional setting I need to know more about. I note the first thing I think of, circle it, and draw a line back to the center word or phrase. Maybe that will remind me of something else, and I create spurs off that word. Sooner or later I’ll go back to the center word and find new ideas that relate directly back to it. At first I’m using ideas I already had in my head, simply laying them out in a “reasonable” manner, but after a while, random ideas jump out and onto the white board (my preferred space). Sometimes ideas and words connect in ways I wasn’t expecting. Let’s say my plot problem is that Jhonal is facing a test, and I’m unsure what outcome is best for the story. Write TEST in the middle and circle it. A bunch of scenarios jump to mind. He can succeed (write that, circle it, and connect to TEST), he can fail (ditto), he can be interrupted (ditto), he can cheat (ditto), etc. How many options can you think of? Then, for each of those, scribble down ideas of what the repercussions of that outcome would be, and link them to the relevant outcome. If he succeeded, then what? If he failed, what might happen next? What might happen to interrupt the test? What might that lead to? Follow your imagination down each path. You may quickly realize it’s too early in the story for Jhonal to succeed in passing the test. Maybe you see what you need here is a loss, not a victory. Or maybe a victory is perfect, and the loss will come right on its heels. Tracing the options using a white board enables your muse to jump to all sorts of ideas and conclusions in a more visual way than using written-out prose to explore them, and may lead to surprising results. Mind mapping can be used for all sorts of problem-solving whether related to your work-in-progress or plans for a birthday party. Try it! This might just be the tool that frees your thought processes. P. S. You can search for mind mapping software via Google. There are free options and paid ones. I’ve used several, but I find that moving away from my laptop gives my thoughts greater fluidity. Your mileage may vary. How many of you got an A in Daydreaming when you were a kid? I think most writers did. A healthy dose of imagination is vital to writing fiction. Your brain has two sides. The left brain is credited with being Logical, which has little to do with imagination and daydreaming. It has to do with rationality and math. We writers need our left brains even though it’s not the fun side. It helps us form sentences other people can understand. It’s the part that analyzes our writing and tells us whether the story has a beginning, a middle, and an end. Sometimes we give too much power to our Left Brain, letting it dictate where the characters will go–only logical places. What they will say–only rational things. Where our punctuation will go–only where Mrs. Brown said it should go when we learned about it in fourth grade. The left brain is sometimes credited with being the Inner Critic. Every word you type, the Inner Critic is leaning over your shoulder, asking if you really meant to write it exactly like that. Surely there’s a better way; if you only let him at the page, he’ll clean it up for you. The problem is that our Left Brains were all trained in the same school. They don’t leave room for individuality, spontaneity, creativity. Sometimes you have to turn off the left brain and work with your right brain. Some people don’t have any trouble doing this–it’s often the pantsers in our midst. Others struggle to open up Pandora’s Box and see what escapes. It might be messy. It might not make sense. It might not fit into a publisher’s box. The right brain is the WRITE brain. It thinks in music and dance and poetry and images and patterns. It thinks in fragrances and whispers and silk caressing your skin. It does not care one iota about logic. It is an awesome place to play. In fact, it’s where your unique writer’s voice comes from. Mind mapping is a powerful technique that gives both plotters and pantsers the freedom to roam the infinite expanse of your minds, gaining unexpected ideas and associations. The technique is worth pursuing because it engages the right side of your brain, aka the muse, which likes to come out and play in unstructured environments. Learn to set logic aside temporarily while researching and outlining, thus seeking out unique relationships between your ideas. It’s hard because your teachers have been training you to be more logical since you were children. You’ve been taught to be orderly and tidy. It seems foolish and regressive to seek out playfulness. As writers, tapping into your right brain, your muse, is vital for you to find your unique voice and your unique stories. Some people find it easier than others to give their imaginations free rein. Getting away from the desk sometimes helps. Going to the museum, playing an instrument, or pulling out your oil paints might be ways you can spend time in you Muse’s territory. It may well overflow into your writing time. Sometimes, though, you have to go purposefully into your Muse’s territory and unlock the gates. How do you do that? One method is mind mapping your muse. An Esmerelda by any other name would be just as sweet, wouldn’t she? I think not. What we name our characters is important. If you’re like me, the story swirling around in your head can’t begin to mesh until you’ve found just the right name. Here are some tips. While many people these days give their kids any name they like with no regard to ethnic background (Siobhan Wong comes to mind as an odd combination of Irish/Chinese! ), if you, as an author, choose similar combinations, you need a real reason why that matters to the story. And you’ll need to provide hints. Writing a real world story set in, say, the northwoods of Wisconsin? A little research will tell you that this area was first settled by folks of Norwegian ancestry. Does that mean you can’t put other ethnic groups there? Of course not. But do keep in mind that the neighborhood, including made-up business names, should contain a balance of names that fit the area. If you’re writing stories set in our real world, think about what names were popular the year your character was born. If you choose to name a person born in 1995 Gertrude, be aware that you have some explaining to do. It’s easy to search baby name sites for popularity in certain decades or years. Some authors gravitate toward names that start with a certain letter, populating a story with guys like Bob, Bill, Brian, and Bert. This is confusing to the reader. Use a wide range of the alphabet for every story. A time to use matching letters might be for secondary characters that ‘go together.’ Stan and Serena were the pastor and his wife in one of my novels. **Unsure how to lay this out? Check the bottom of the post! Not only watch the first letters of the names, but the rhythms they provide. Don’t use all one syllable, or all two syllable. Watch your name list for similar endings: Bevan, Kevin, Raven. Those would pass the ‘first letter’ test, but not this one! Do check the meaning of the name you’re considering. This may not be a dealbreaker, but in some cases it could be. On the plus side, knowing the definition may help with character building. Is the name you’re considering that of a famous person? Certain names, or combinations of them, will send readers down a particular path. Adolf may be a poor name for your lovable hero. Naming your hero William and your heroine Kate is also a bad idea. If you have a medium to large cast of characters, you’re challenging your readers’ ability to keep track of everyone’s names, especially if some of the characters come and go. Limit adding nicknames for them as well, and if you must, keep them as close to the usual name as possible. My novella’s main character is Lyssa, but her roommate calls her Lys. I think that works! With all that in mind, how do you choose names? A couple of baby name books won’t go amiss, but there also plenty of online sites. If you’re looking for a specific ethnicity, google ‘baby name girl chinese’ for example. If you’re looking for names for a character in her fifties, google ‘girl name 1950’ to get lists of names that were popular in that era. For general baby name sites, check out some of these–of course, there are plenty of others! **Click here for my A-Z Character Name Template. Feel free to download it and duplicate it as many times as you’d like, or make your own in Word or Excel. As you name characters, drop the name into the corresponding slot. This gives you a birds’ eye view of your naming conventions and will help you spread the wealth throughout the alphabet. I have one for each novel I’ve written. What tips do you have for naming characters? Is there anything I’ve missed?